Frit (Multicomponent Glass) | Products | Tokan Material Technology Co., Ltd.
Frit, a glass coating material available in slurry or powdered form, allows you to add appearances and functions not present in the base material. Currently, frit is mainly used as coating for porcelain enamel products, providing it a delicate and glossy surface touch, with excellent heat resistance. However, using our proprietary know-how, we have developed frit featuring great colors and special physical or chemical properties to further expand its potential. Our technology has received high marks from customers of a wide variety of fields, ranging from housing to automotive manufacturers. Porcelain enamel frit significantly improves the properties of the base metal such as resistance to acid, alkali, and resistance to hot water. Our porcelain enamel frit product line can be used on a wide variety of base metals, such as cold rolled steel sheets, cast iron, stainless steel, aluminum, and copper, and is available as frit flakes, or fabricated products (general-purpose slip, static glazing slip, RTU (Ready-to-Use), RTM (Ready-to-Mill)) to meet various customer needs. 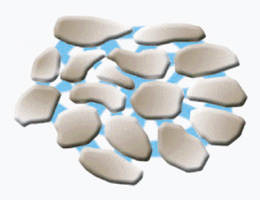 Another major characteristic of our frit products is that they systematically reduce the environmental load. In recent years, the restrictions on environmentally hazardous substances such as heavy metals are becoming tighter in all countries around the world, starting with Europe. Users of our product include many big companies doing business in the global market by clearing such restrictions with advanced technology. •Main Applications: Household utensils, interior/exterior panels, anti-corrosion heat exchanger elements, water heaters, built-in kitchen unit, kitchen sinks, bathtubs, etc. For glaze frit to be suitable for use on ceramic tableware as glass coating material, the most important environmental requirement it needs to comply with is being lead-free. Ours comply with "The Safe Drinking Water and Toxic Enforcement Act of 1986 (Proposition 65)", one of the strictest law in the world passed in California, USA to prevent the elution of lead from ceramic containers, achieving a high level of leadlessness. 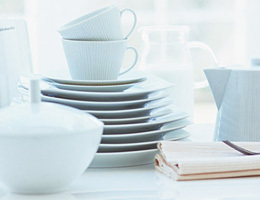 Furthermore, we also strengthened our support for a wide variety of ceramics as characteristics vary from one tableware manufacturer to another. Our rich track record of providing custom-made products, fine-tuned to meet individual needs is also a major characteristic of TOMATEC. •Main Applications: High-end tableware (bone china, stoneware, dolomite ware), tiles, sanitary ware, graphite crucible, spark plug, etc. 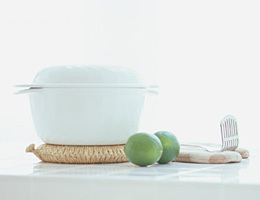 Home appliances are now an integral part of our lives. They are made up of electronic parts, which use large amounts of ceramic materials. Our product, frit for electronic devices, is used in places that are normally hidden from view such as Low Temperature Cofired Ceramics (LTCC) and as additives for metal lines. Most are proprietary, custom products made in accordance with customer requests. 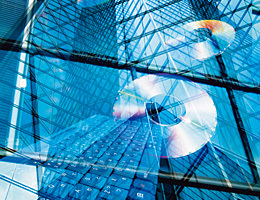 Though we cannot disclose details, we enjoy high marks from many electronics manufacturers for our sophisticated and high-precision design supporting the latest electronic device development, product development with systematic reduction of environmental load, advanced production technology achieved through special production processes, and advanced quality control. •Main Applications: Electronic parts (Low Temperature Cofired Ceramics (LTCC), insulation coating, additive for electrode paste), special purpose (low-temperature hermetic sealing, sintering additive, low expansion filler), etc. 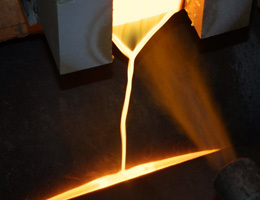 Is used to simultaneously fire with low-resistance wiring metals such as silver by lowering the sintering temperature of ceramics such as alumina. It requires strict control in glass composition and granularity as it is used for electronic circuit boards. Is used to provide insulation and smoothness. It is used as cover coat for metal interconnections on ceramic substrates and circuit boards. Has enough fluidity even at around 450˚C. It is used for hermetic sealing requiring heat treatment at low temperatures and electrode binders. Using its technological strength, TOMATEC has widened the fields of application of the frit, which is now found in unexpected fields. One such example is the frit grinding machine, a tool primarily used in the auto, iron and steel, and bearing industries to grind mainly metal parts and materials. 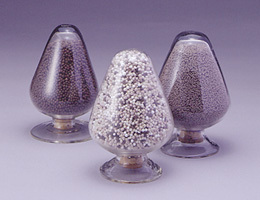 Abrasive for these machines includes alumina and silicon carbide, which use a vitrified or resinoid bonding agent. It is in the vitrified whetstone where our frit is used as bonding agent. We also use our advanced technology to provide products meeting the needs of our customers in such a niche field. 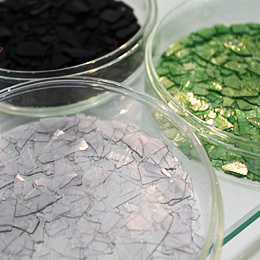 By applying our frit technology, we make unique products to meet the needs of our customers. One such example is "AKNAS", the antioxidant and decarburization inhibitor used by major iron and steel manufacturers to prevent oxidation and decarburization of steel and the like under high temperatures. This is a product for steelmaking we developed from our glass coating technology. When applied on the steel before heat treatment, it reduces scale loss (material loss due to rust) and simplifies post-processing (cutting, polishing, pickling, etc. ), contributing to the improvement of yield in steel products. TOMATEC Filler (transparent inorganic filler), used as transparent filler in the production of artificial marble is the result of applying our inorganic material technology into plastics and expanding the world of frit to other materials. 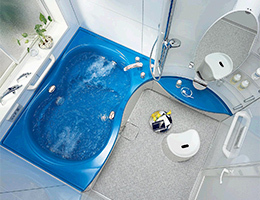 It is used in bathtubs and washstands due to its transparency, achieved by adjusting the refraction index of the glass, and superior heat resistance. As an indicator of its potential for new approaches to glass materials by resin manufacturers, we expect its fields of application to be further widened in the future. When used as an additive, it improves the heat resistance and strength of paints. 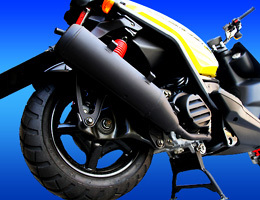 It is already widely used by leading foreign and domestic motorcycle manufacturers. However, in recent years, its fields of application are widening gradually, and is used, for example, as coating for the outer surface of frying pans. This is a material we want to further widen its fields of application, to where resistance to fire and heat is a primary requirement. Did you know that glass can slowly dissolve in earth? F∙T∙E (micronutrient fertilizer) is based on this property. Though in tiny amounts, manganese, boron, iron, zinc, copper, and molybdenum are six critical elements for crops to grow healthy. By applying our glazing technology, we managed to commercialize these nutrients as a vitreous fertilizer. F∙T∙E is an environmentally friendly composite vitreous micronutrient made to slowly dissolve for absorption during the crop growing season. With F∙T∙E, crops can be grown under the best conditions for each region as we can adapt it for any soil.